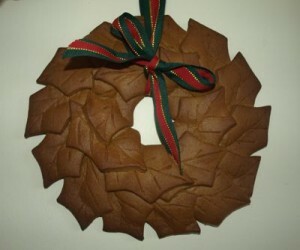 What could be wrong with the concept of an edible wreath? http://www.taste.com.au/recipes/15035/gingerbread+house substituting the sugar for 1 slightly packed cup of muscovado and treace in place of golden syrup. I mixed it in the thermomix but the batch was too large for it to handle so I finished combining and kneading by hand.We got enough gingerbread from this batch to make one large wreath, one small and a batch of biscuits to leave out for Santa tomorrow night. 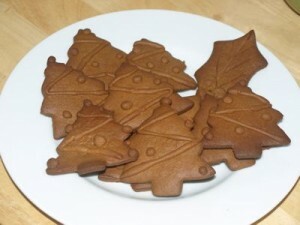 To form the wreath, use a holly leaf cookie cutter and score the veins in with a knife. On a sheet of baking paper, trace the outside of a bread and butter plate. Layer the leaves around the edge and bake at 180 degrees for 20 – 25 minutes. 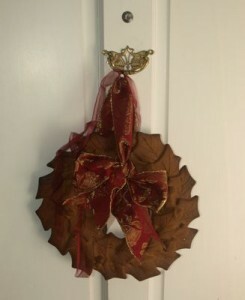 Allow to cool completely before hanging from a fabulous Christmas ribbon. If you can keep the Ankle BIters at bay, it should keep for about a week. I really didn’t mean to be derogatory! I meant it in my usual curious way. I just can’t imagine myself ever wanting to do that. But the end result was great and I can’t wait to eat it on Christmas! Hey! I can post comments again! (I was having enormous trouble posting comments on your blog there for a while). I can’t actually believe this wreath! It’s so decadent. I have an image of someone passed out, smeared with chocolate beneath the remains of said wreath on Christmas morning, (a la the Priest in Chocolat).